Back in my Pho Tan post, I joked about how I was tailed by a police cruiser while I was circling in Whalley. I remarked that if arrested, it would become Sherman's Jailhouse Adventures. While I'm in no rush to be incarcerated, especially given the lack of food choices, Viv and I did come as close as we could to a corrections institution. 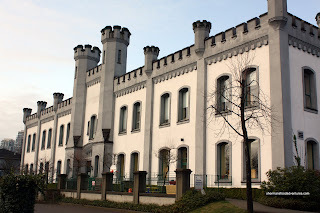 How about a former penitentiary now housing a restaurant? Yup, the premise behind "The Pen" is it's jailhouse theme. Located in the now defunct BC Penitentiary, the restaurant is complete with barred windows and servers with prisoner numbers on their backs. Yah, there is a certain charm with the plac e, especially with its quaint location and nice view of the Fraser. Seeing how we were without food on a Sunday morning, we decided to take the whole family out for breakfast. Well, that's not totally true, we did have eggs, sausage and pancake mix at home; however, that's not very interesting. So off we went to The Pen! Of course, a breakfast is not a breakfast without pancakes. At least that's what my son would like everyone to believe. Thus, we ordered The Works Pancakes for my son and daughter to share. 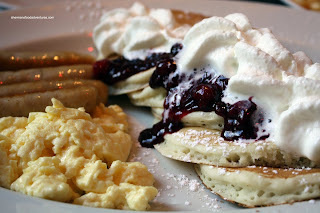 In addition to the 5 fluffy pancakes topped with berry sauce and whipped cream, there were 4 sausages and scrambled eggs. Breakfast is not rocket science; but it was nice to see that the eggs were indeed scrambled and the sausages cooked without being burnt. Viv went for the Eggs Benny with bacon and tomato. Nothing particularly amazing about this breakfast; but nothing bad either (well, except for the squishy hash browns). English muffin was toasted, tomato fresh, bacon crispy and poached egg runny. 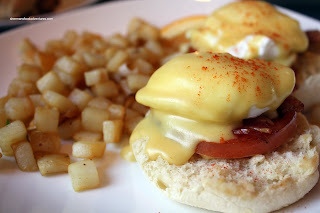 Hollandaise sauce was not bad, could've used a bit more lemon. Otherwise a decent eggs benny. 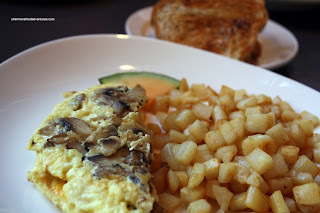 For myself, I went for the Cheese and Mushroom Omelet. Served once again with the squishy hash browns, the omelet was a bit small. Furthermore, I found the eggs to be cooked a bit too long. I did like the toast though, it was crunchy and well-buttered. Overall, I thought the food was alright. Once again, breakfast is not rocket science. I'm not sure if it warranted the price we paid; but the real draw here is the location and the "uniqueness" of the place. Looking out the window, there is a view of the Fraser River and honestly, on a sunny day, it made for a pleasant breakfast. wow, that building is huge. it's not all the restaurant, is it? looks like a fun place to go for a change in atmosphere. Yah, the building is a decent size; but only a portion of it is the restaurant. I thought that it was a neat setting that is a bit out of the ordinary. The hash browns actually look squishy..what a perfect description for them. I'm with you on the 'neat' factory, adds a little something to an ordinary experience.